While the European Parliament itself is largely impotent, with the real power to propose and direct legislation given to the unelected European Commission, the vote is being seen as one that will inform the tone and direction of the European Union for the coming years. 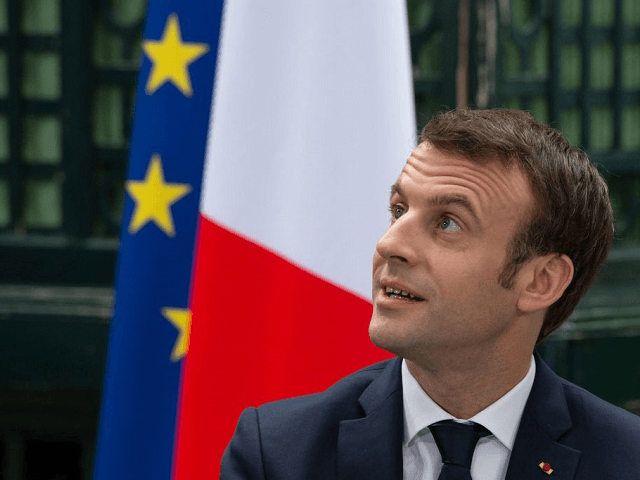 Given several recent polls and projections that suggest populist parties are likely to surge in the vote, loyal Europhiles including President Macron have made campaigning in the vote a personal interest. On these alleged lies and accusations of “fake news”, the loyal globalist had specific complaints. Somewhat counter-intuitively, Macron rhetorically asked of the level of information available to voters before the Brexit vote: “Who told the British people the truth about their post-Brexit future? Who spoke to them about losing access to the European market? It is not clear whether Macron meant withdrawing from the Common Market as part of Brexit — which was made clear would happen during the Brexit campaign, and even in the government’s own leaflet calling on the British people to vote to remain — or losing the ability to trade with Europe at all, which has not been suggested as a possibility by any actor within Brexit negotiations. Macron’s letter also had a series of improvements he wanted to see in the European Union, all of which means transferring further power and sovereignty away from member states to the centre in Brussels. Perhaps the most sinister move was the call to remove the ability for European nations to control their own elections, and to have them overseen instead by a “European Agency for the Protection of Democracies”, run by “European experts” sent to each country. On the restriction and regulation of the internet, Macron wrote “We should have European rules banish all incitements to hate and violence” online, comments that come just weeks after the French leader suggested anyone convicted of “hate speech” online could be banned from all social media for life. While Macron has enjoyed some support across Europe for his words, and not least from Belgian Prime Minister Charles Michel, whose small country benefits from being the main home of the bodies of the European Union, the rambling 1,600-word letter has been the subject of some scorn within France. Also featuring is senior National Rally (formerly Front National) candidate Jordan Bardella who said of Macron’s globalist rant: “Macron is all alone on the European stage. He got angry with the countries in the East, treating them as though they were insane. He got angry with Italy, treating it as a nationalist leper.